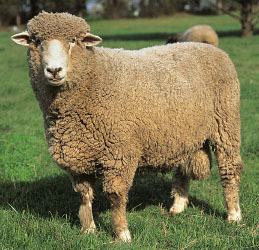 Corriedale sheep were developed in New Zealand and Australia during the late 1800s by crossing Lincoln or Leicester rams with Merino females. The breeds is now widely found worldwide and are the most common breed of sheep in South America and are widely used throughout Asia, North America, and South Africa. They are, perhaps, the second most populous breed of sheep in the world, after Merinos. Corriedale sheep are a dual-purpose sheep. They are large-framed, polled, and have good carcass quality. Although they traditionally have been used to produce premium lambs when mated to sires of meat breeds, they are now achieving comparative performance rates with purebred lambs. Corriedales produce bulky, high-yielding wool ranging from 31.5 to 24.5 micron fiber diameter. The fleece from mature ewes will weigh from 10 to 17 pounds (4.5-7.7 kg) with a staple length of 3.5 to 6 inches (9-15 cm). The yield percent of the fleece ranges from 50 to 60 percent. Mature rams will weigh from 175 to 275 pounds (79-125 kg), ewe weights range from 130 to 180 pounds (59-81 kg).